Streptococcus agalactiae, MicroKwik Culture®, Living, Pathogen, Vial is rated 5.0 out of 5 by 1. Every culture is guaranteed for species and purity. Bacteria cultures are labeled by genus and species name, media on which they are cultivated, and temperature for optimal growth. All Gram staining is based on 24-hr cultures. Special packing and transportation costs are extra for animal and human pathogens. This culture is Group B streptococcus; beta hemolytic, Gram+, nonmotile cocci in pairs. It is cultured on tryptic soy agar with 5% sheep blood at 37° C. Each culture contains enough material for a class of 30 students. 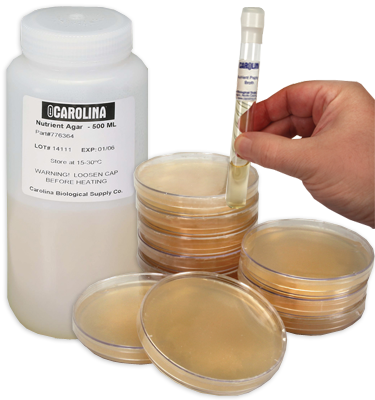 MicroKwik Culture® is a Carolina trademark for freeze-dried, viable bacteria plus medium. Since MicroKwik Cultures can be stored under refrigeration, they can be ordered ahead of time. Per vial. Note: Each MicroKwik Culture® comes with 5 mL of rehydration medium. Restricted to colleges and universities only. Item #155690A is a pathogen (Human or Animal). Cannot be shipped to high schools, preparatory schools, or individuals in accordance with guidelines of the US Department of Health and Human Services. Rated 5 out of 5 by JLL5 from Easy to use The MicroKwik cultures are easy to use and prepare when needed.